2006 Yamaha BWs MotoGP. yamaha moto gp. Submit more pictures. Yamaha continues its winning ways in 2005, as thanks to an exclusive deal with MotoGP organiser Dorna, Yamaha is now the official MotoGP paddock scooter supplier. 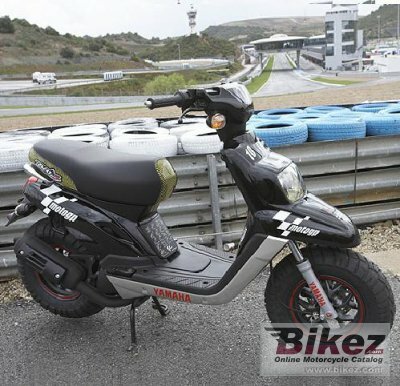 The machine of choice is the new BW�s MotoGP, specially designed to reflect its important role. Ask questions Join the 06 Yamaha BWs MotoGP discussion group or the general Yamaha discussion group. Get a list of related motorbikes before you buy this Yamaha. Inspect technical data. Look at photos. Read the riders' comments at the bike's discussion group. And check out the moped's reliability, repair costs, etc. Show any 2006 Yamaha BWs MotoGP for sale on our Bikez.biz Motorcycle Classifieds. You can also sign up for e-mail notification when such mopeds are advertised in the future. And advertise your old MC for sale. Our efficient ads are free. You are also welcome to read and submit motorcycle reviews.